Kelsey Hayes is no ordinary college freshman. In fact, the eighteen-year-old girl has just returned from India, where she risked her life—and her heart—to rescue a handsome Indian prince from a terrible curse. Back home in Oregon, Kelsey is determined to move on, despite the lingering feelings she has for the man she left behind. She meets Li, a completely average guy who offers the promise of an ordinary, curse-free life. But just when Kelsey is ready to move on, Ren reenters her life, on a quest to reclaim her heart. Danger threatens their newly rekindled love and to save him, Kelsey must journey with someone else—a man who wants her for himself. 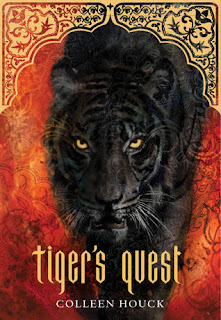 The saga begun in Tiger’s Curse continues in Tiger’s Quest, as Kelsey finds herself in an epic battle between good and evil. From the shores of the Pacific Northwest to the jungles of India, the mountains of Nepal and Tibet, and the mystical realm of Shangri-la, this suspenseful tale of love, sacrifice, and redemption is not to be missed. The tiger's quest is the second instalment. I enjoyed it as much as the first and have been left with a huge and impossible decision which tiger do I like best? Black or White? The book starts back with Kesley. She is back in America, starting college (with a lot of help from her Indian friends) and trying to get on with her life after making the decision to leave Ren. She starts to date other men and tries to see how she copes without the Tigers. That is of course until they start showing up in her life again. Ren comes back unable to without Kelsey. I loved the bit where he encourages her to date other men in order for her to make her own decisions about who she should be with and was often left in a completely frustrated state by their inability to sort it out and get together. I loved it when things did and everything for them was back on track. As always things aren't always that perfect and easy. Ren and Kesley are found by the people looking for them and are separated, Ren being captured in the process, and Kesley is thrown together with Ren's brother in another quest to find a prized artifact and save Ren. I must admit I really was quite anti Kishan all the way through this book right up until the very end when I quite quickly changed my mind. What I like about these books is that they don't save up all the action until the very end. I like how the exciting events are spread out quite well through the books meaning that you are not waiting long until something else happens which is something that keeps me reading page after page long after I actually intended to finish reading for the night. The only thing that I didn't like about this book was that it ended on another gut wrenching ending which was extremely frustrating. The wait between books is going to kill me! I've been hearing a lot of things about this book lately. After reading your review, I'm definitely going to check it out.